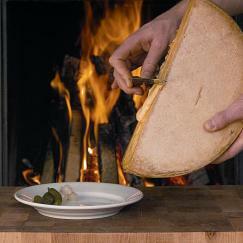 Raclette is a semi-firm, cow's milk cheese, made in the alps of Switzerland and France and aged from 3 to 6 months. It is also a means of serving the cheese, not unlike fondue, in which the wheel is heated by a fire or heat-lamp, and the melted surface of the wheel is scraped onto a plate. In fact, the French verb racler means "to scrape." Along with the melted puddle of cheese, one traditionally serves cornichons, pickled pearl onions, and one or more small boiled potatoes. 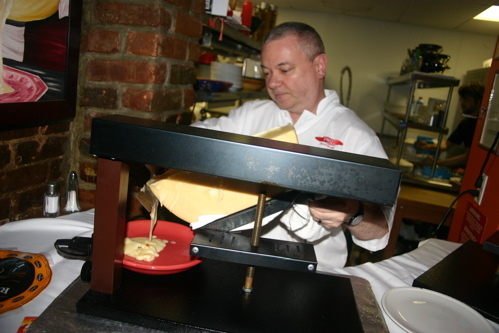 Last week Emmi USA, the largest importer of Swiss dairy products in the country, invited me to a "Raclette Party" held at Swizz Manhattan, a Swiss-American restaurant in Hell's Kitchen. 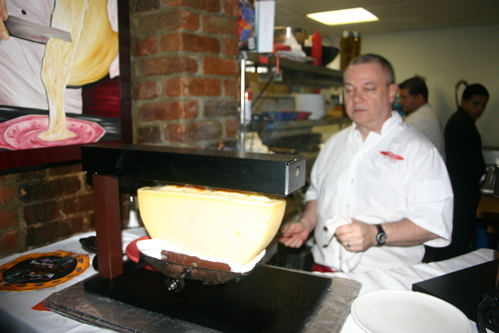 (Swizz actually offeres a Raclette dish on their regular menu; appetizer portion $10, All You Can Eat for $26.) Though I'd previously tried the cheese on its own, this was my first time experiencing it prepared the traditional way. The cheese itself is mildly savory when raw, but when melted and scraped it attains a toasted, caramel-like flavor. Combined with the potatoes, cornichons and pickled onions, it is a delicious, hearty dish. Delicious, yes, but I wouldn't subject just any cheese to such a treatment. Raclette melts very well and is mild enough that toasting it provides just enough flavor. I can't imagine toasting, for example, an aged clothbound cheddar the same way. Neither the texture nor the flavor would be right. For those of us who don't have a fireplace or a heat-lamp, one can use one of these fancy tea-light raclette scrapers. Guaranteed to become the next hot wedding registry item! 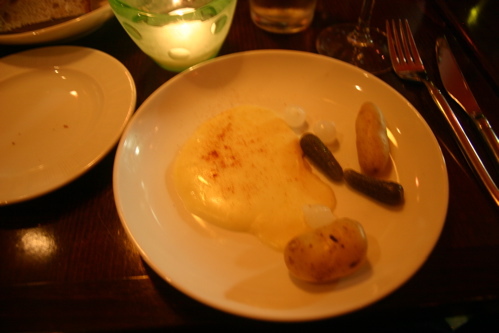 Traditional Raclette dish, with cornichons, potato, and pickled pearl onions.